Gaynor Almond BA (Hons), GJC, CRM5, PRM is a Professional, Qualified and Fully Insured, Registered Clinical Reflexologist. Gaynor is an extremely passionate and dedicated reflexologist, Helping people to achieve Emotional and Physical Wellbeing. Based in Northwich and at Cheshire Natural Health in Stretton South Warrington (just off Junction 10 M56), Gaynor also offers home visits in and around Northwich, Knutsford, and Tarporley in Cheshire. To request a call back for a Home Visit in Northwich and other areas of Cheshire, or at one of the clinics click here and include a contact number or call or text 07895756252. Gaynor is trained to the highest level in Reflexology, CRM Level 5 Mastership, including anatomy and physiology, and is a full member of Professional Reflexology (PR),. Constantly updating her skills, Gaynor is highly trained in helping with all aspects of health from purely relaxation to help reduce stress and anxiety (one of the main causes of ill health). Helping to reduce swelling (water retention) caused by injury, standing too long, immobility, pregnancy, post surgery. Supporting mums-to-be through the duration of their pregnancy, and helping couples get on track with their fertility. Whatever you need help with, reflexology is a good all-round holistic treatment to get you started on the right foot to improving your health. Whether you are looking for a bit of ‘you time’ of sheer relaxation, struggling with stress brought on by work, home life, or simply from just being too busy, reflexology can work as a preventative and an effective treatment for combating stress. Reflexology is such a relaxing treatment it naturally encourages the release of endorphins within the body, the ‘feel good’ hormone which helps to lower blood pressure, alleviate stress and anxiety; and acts as the body’s natural pain relief. 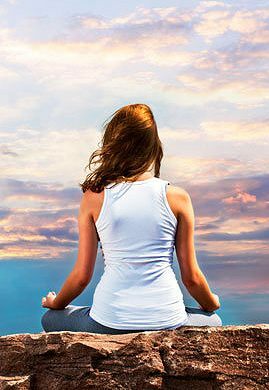 Enabling your mind and body to switch-off leaving you in a state of restfulness, reducing body tension, and helping you to feel calmer and more balanced. Which may improve sleep, increase blood circulation and boost your immune system, leaving you feeling more energised😌. "Elevated cortisol levels [the stress hormone] interfere with learning and memory, lower immune function and bone density, and increase blood pressure, cholesterol and heart disease". As well as taking time to relax it's also important that you look at your life style as a whole, avoiding stressful situations, taking regular exercise, and eating a healthy diet leading you towards a more balanced life. 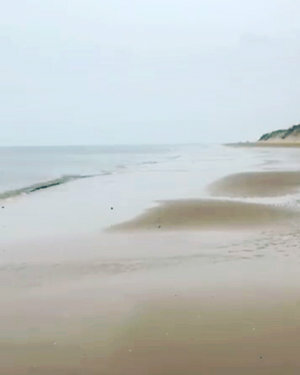 Find Your Calm💜 My Calm is going to the beach and just looking out over the sea. 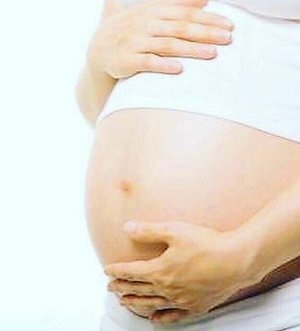 Help with Fertility For Couples Trying to Conceive Naturally, or Undergoing Assisted Fertility. Looking for help with your Fertility? 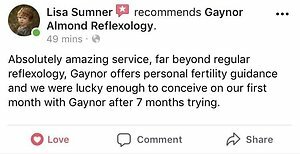 Gaynor specialises in the treatment of infertility offering fertility reflexology to couples from Greater Manchester, Warrington, Macclesfield, and across Cheshire including Knutsford, Northwich and Tarporley. Whether you're trying to conceive naturally, or undergoing conventional treatments such as Clomid, fully medicated cycles IUI, IVF, ICSI or donor eggs, Gaynor will work closely with you and your partner, to ensure you're giving yourself the best possible chance of a positive outcome. Trying to conceive can be stressful in itself and this can certainly impact upon your ability to conceive. As reflexology is a deeply, relaxing holistic experience, it will leave you feeling rejuvenated and de-stressed, helping your body to work more harmoniously. Please contact Gaynor for an initial consultation. "Can Reflexology Help Overcome Infertility?" Who Else Can Benefit From Clinical Reflexology? Everyone!🙌 If you’re looking for help with your health reflexology can be a helpful complementary therapy for people of all ages, with all kinds of conditions. Clinical Reflexology is a completely natural, non-invasive, holistic therapy that works by stimulating the reflexes on the feet corresponding to a specific gland, organ or part of the body in order to detect any imbalances, and encourage your mind, body and spirit to achieve balance and healing. Clinical Reflexologists are concerned with the underlying cause of the condition rather than just the symptoms. Symptoms can materialise as a result of a combination of physical, environmental and emotional causes, by identifying the cause we can tailor a treatment plan for the individual. "Research studies...indicate positive benefits of reflexology for various conditions. In Particular...to reduce pain and enhance relaxation, sleep, and the reduction of psychological symptoms, such as anxiety and depression". Reflexology will enable your mind and body to switch-off leaving you in a state of restfulness, releasing tension and helping you to feel calmer and more balanced. To read more about what Reflexology is, how it works and what to expect from your first treatment ....click here. UoM "What Does the Research Say about Reflexology?" UoP "Reflexology reduces feelings of pain"
Offering Mobile Home Visits in Northwich, Knutsford, Tarporley, and all areas of Cheshire. 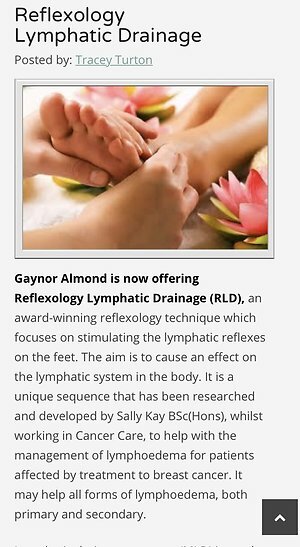 To book a Mobile Reflexology Treatment with Gaynor ...click here. As reflexologists we do not claim to cure, diagnose or prescribe, and therefore reflexology should not be used as an alternative to seeking medical advice. Gaynor Almond Professional Clinical Reflexologist BA (Hons), GJC, CRM5, PRM. As a Professional Reflexologist Practitioner, Gaynor is passionate about helping people to achieve emotional and physical wellbeing. Aiming to treat the 'whole person', Gaynor provides a complete therapeutic and holistic experience with an analysis of your medical history, life style, and feet for any obvious imbalances. Leaving you feeling deeply relaxed and rejuvenated, helping to aid healing by restoring balance to your mind and body. I am really pleased to announce I am now part of the team at Acupuncture That Works (ATW), offering reflexology teatments in Northwich. Click on the image to find out more. To read more click on the image. 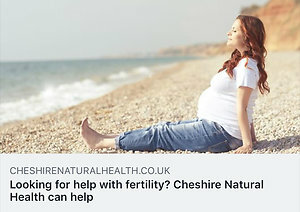 I offer fertility reflexology at Cheshire Natural Health on Fridays and Saturdays, home visits are available on other days💜. Reflexology feels like you’re walking on fresh grass and Cherry Blossom Petals🌸💜. Well it does to me😉. 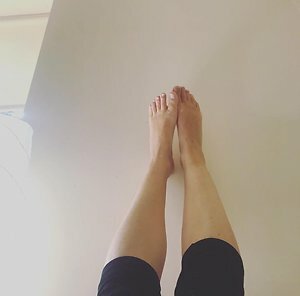 ‘Legs Up The Wall’ Yoga Pose🧘‍♀️💜. Nothing like the smell of freshly baked bread😋. This bread is gluten free, wheat free and yeast free! I offer alternative Saturdays at the clinic for clients who have no availability through the week, but try to book ahead as Saturdays can get quite busy. Add the juice of 1/2 a lemon to a glass of ‘clean’ boiled water cooled down a little,. Great for detoxing the liver to help keep your hormones in check, and kickstart your metabolism. Add some raw honey or infuse with raw ginger, to benefit from their anti inflammatory and antibacterial properties😉. Ideally we need around 8-9 hours sleep a night to function effectively. If you're not getting a proper nights sleep due to stress from work or home, it will naturally start to have an impact on your health and mental state. ⭐️️Try to get into a good bedtime routine, aiming to go to bed and wake at the same time everyday. ⭐️️Turn off all electronic equipment a couple of hours before going to bed. ⭐️️Don't eat too late, give your body time to digest your food before going to bed, and ensure you're well hydrated. ⭐️️Have a warm relaxing bath, with 2 to 3 handfuls of Epsom salts to help relax your muscles ready for sleeping. ⭐️️Try to cut out or reduce all stimulants like alcohol and caffeine, opting for a caffeine free herbal tea instead before bed. ⭐️️Read a book for an hour or so in bed, this can help you to drift off naturally. ⭐️️Make your bedroom and bed inviting, keep the temperature cool rather than too hot. Sleep naked! ⭐️Try putting a couple of drops of lavender essential oil on your pillow to aid restful sleep. Make time for a little you time💜. 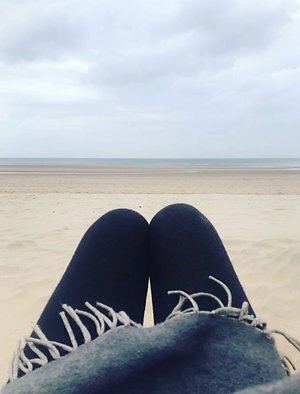 Taking time out to gather your thoughts doing something you find stress free and relaxing, helps to recharge your batteries ready to face the rest of your day🙂. Walking is not only good for your health, it can help to free your mind from all your worries, all part of the healing process. Lovely card from a new mummy💜. Healthy smoothie to kick start your day and your fertility😉. Topped up with unsweetened almond milk. Brazil nuts are high in selenium, packed with vitamins and minerals, and a great source of protein and omega-6, all essential for healthy sperm. Trying for a baby can be stressful in itself, affecting your hormones, mood, and libido. Taking some time out for yourself each day is essential for your wellbeing, and can really help to address those imbalances.